Well, it’s safe to say I had too-high expectations for this issue, coming off the previous issue AND Action Comics #975. 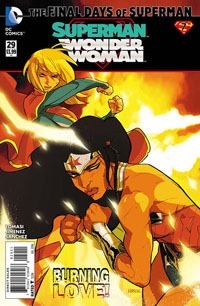 Though this issue advanced stuff a bit, it did not on initial reading hold up to my own internal "hype." With the villain revealed, we basically get to see Clark and Lois being made to forget their life together, their son Jon, and to play along to Mxyzptlk’s game. 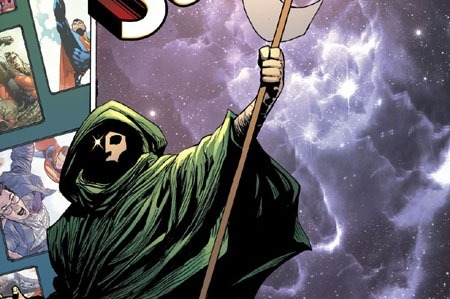 As the issue ends, we have a bit of a throwback on stuff, that can kinda call into question this arc’s title and make one really wonder what’s going to happen in the fourth/"final" chapter before we head into April’s DC stuff. Yeah, that’s all a bit vague, especially for a review, but this issue was all over the place–capitalizing on Mxy’s reality-bending powers and inclinations. And this is my "snap judgment," initial thoughts after having just read the issue, taking it–as I try to all my reviews–on a first reading without getting overly deep into it. My preference, my style. The story picks up from the first half of Action 975, and seems to almost ignore the secondary Dini story. It also seems slightly out of nowhere to me, like I missed something. We had intro/setup stuff and the building of tension in the first chapter, getting things rolling. The second chapter brought that stuff to a head and revealed the villain of the story as well as paying off most of a year’s worth of build. I’ve plenty of anticipation and suspicions as to possibilities for how this story might end…so this "middle chapter" that’s neither setup nor conclusion is somewhat stuck in place, unable to conclude stuff, but not much new to be able to put out there. The imagery is a bit wacky and trippy…which perfectly fits with Mxy and his powers and such. But it also made for a too-quick read; I rarely "like" multiple splash pages or double-page splashes and find them to be a huge "cheat" story AND page-wise in modern comics. That said, the spread with the game board worked quite well for me, all things considered. This issue does not "sell" me on Mxy’s legitimate motivation for stuff…where it actually made sense in the Action Comics chapter, here he just comes off as petty and mean…I didn’t feel any of the "heart" of his motivation here. I’m quite certain virtually no one–especially in this day and age–is gonna be inclined to "jump in" with the 19th issue of a series, labeled chapter 3 of a story. This is not something for a first-time reader, but is an issue for the ongoing reader, or the reader who’s dipping their toe in for this ARC. In a way, this issue feels nearly "skippable" or extraneous, though I’m sure some small "details" will play into the conclusion and whatever status quo going forward from next week’s chapter. I would not actually recommend skipping this issue, but I’d highly recommend that anyone thinking of picking this up also pick up the first two chapters with plans to grab next week’s fourth chapter! I was also slightly incorrect in my "assumption" of the covers for this story: they ARE going to join together in a 4-panel connected image…however, rather than a 2 x 2 configuration, they’re a 4-panel "tall" configuration (which is shown in the text piece on the final page of the issue, after the story itself). 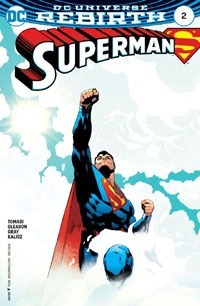 I buy each new week’s Superman book pretty much as an extremely welcome again (after some 6 or so years away) "habit"–and have since about this time last year. That said, the covers rarely "grab" me–I recognize them, the issue gets paid for and taken home, and read. THIS issue, though, really jumped out at me for its coloring/color-scheme, the visual design, and somehow being rather unexpected to me. 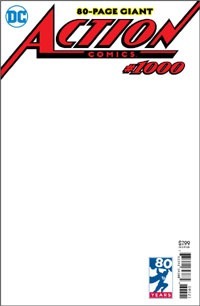 It also seems like it’s a small piece of a singular image that I can imagine being spread out across at least 3 more chapters of this story (though I’ll be highly annoyed–to say the least–if such a thing would merely be VARIANTS for this single issue. I’ll hold to my notion until at least next week, though, and give the publisher the benefit of the doubt for now). This is the opening issue of a fairly "hyped" storyline that I’ve been looking forward to despite some disappointment at how the Clark Kent story seemed to "end" over in Action Comics last week. (Though I’ll give it credit for playing into continuity and this feeling largely like "just" the next issue in sequence OF an ongoing thing). We open on a brief scene of someone–presumably this Mr. Oz–musing on time/space blah blah blah, and then seeing multiple individuals in his "collection" acting out–reacting to the fact that SOMEONE (we aren’t told who) got out. 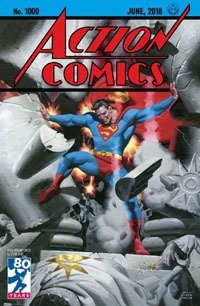 Looking to the empty cell, we see graffiti indicating an extreme hope in Superman…before shifting to Hamilton County and the main part of the issue. 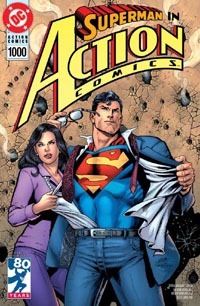 Clark, Lois, and Jon are celebrating the couple’s anniversary when there’s a knock at the door. 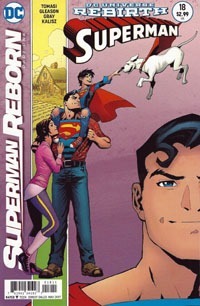 The "other" Clark Kent seems to have left something for the family (and majorly spooks Krypto!). They find that it’s a scrapbook with photos that no one on this Earth–let alone reality–"should" have. 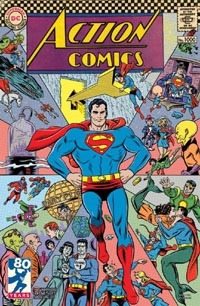 Its images shouldn’t even exist, they were wiped out with Clark and Lois’ Earth. Before they can dig all that deeply, they notice their house is on fire…but quickly realize it’s not so much on fire as being ERASED. Then to make it WORSE…Jon’s being erased. 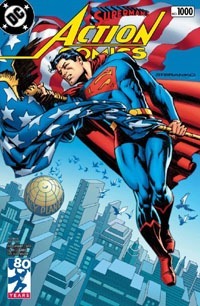 Superman leaps into action to save his son, as any father would. And we see the maddening, helpless desperation of our hero and his wife as they see everything they know and love…erased. Talk about a setup and leaving one hanging! 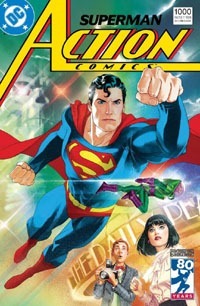 I’ve loved only having to wait two weeks between issues for Superman and Action Comics since last spring…but this would be flat-out frustrating to have to wait an entire two weeks…I’m anxious for the next chapter, in next week’s Action Comics…by the time of this post, a "mere" 5 days, and that seems too long! There’s plenty to be found within this issue and its story. We have stuff pointing to the larger DC Universe as it now stands. 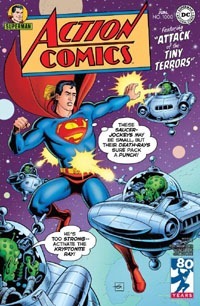 We have stuff rooted firmly within the Superman books, and specifically this title. We have reference to earlier issues, and we have references to pre-Flashpoint elements. So it seems that we’re getting some major payoff about to really kick into gear after most of a year of building. Still more, we have a story that seems like it’s pretty self-contained to the Super-titles, not some line-wide must-buy-them-all crossover or such. 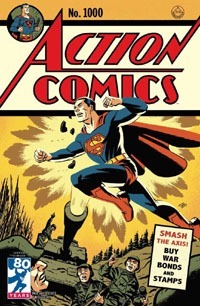 I believe some of the events of this book might trickle out and be reflected in other titles, but in this issue we’re only directed to Action Comics, next. 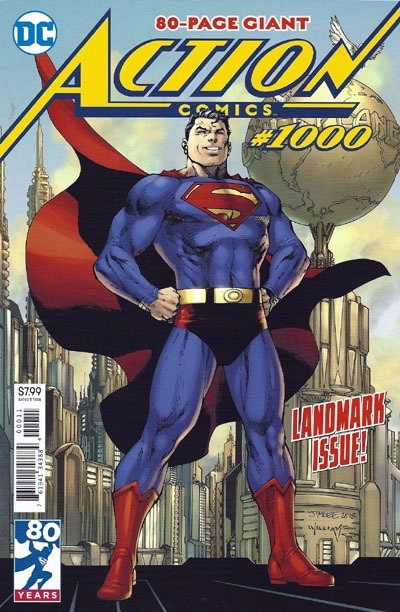 This may not be the BEST issue for a new reader to start with…but it’s not horrible, and I also think a lapsed reader could probably do pretty well here, just knowing that this is pre-Flashpoint Lois and Clark; that they have a son, and there’s been some other Clark Kent around. Visually, I have very mixed feelings on this issue. On one hand, I like the cover, and most of the interiors are ok. 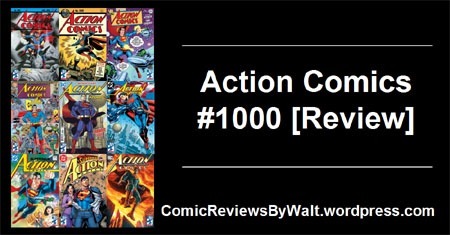 There are a couple panels–one with Tim Drake (Robin/Red Robin) and one of Jon–that just look really off to me. While Tim’s appearance can be chalked up to his imprisonment, the first large panel of Jon just looks too cartoony to me, overly manga-styled for what is NOT a manga volume. I suppose comparison could be drawn as well to Ed McGuinness‘ art (I’m thinking around 2000 or so), but in the moment, it just threw me off and had me feeling a lot more nitpicky about the issue. The cover, though, is pretty darned good, and would make an excellent print for hanging…and if this indeed is part of a multi-part image, I dare say it’ll likely make a fantastic poster. All in all, even if you’re not "up" on the various Superman titles, if you’ve a passing familiarity, I’d definitely recommend this issue. It’s well worth its $2.99 cover price, and does a nice job of setting stuff up for what ever is to come, while providing its own major chunk of story and key event for things. I’m eagerly anticipating the next chapter, and to see where things go in general with this story, and the Super-books in general! I’ve been looking forward to this title for quite some time…for a number of reasons. 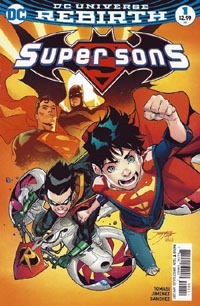 One being the fondness with which I recall reading some of the "classic" "Super Sons" stories in Grandpa’s old comics. Another being the inspired nature of putting Damian and new Superboy Jon Kent together and seeing the two playing off each other–my having come to "accept" Damian, and being quite open to the possibilities of a Superboy who is not "just" Superman as a boy or an adopted "clone" or such…but the biological, actual SON of Superman. Then there’s the simple fun of "Son of Batman" with "Son of Superman" and their being kids, and far less "need" for decorum, professionalism, etc. As kids…there’s bound to be a certain lack of a "filter" and hijinks can ensue. We open with a creepy-ish scene with a family that reminds me a bit of that episode of The Twilight Zone—It’s a Good Life–with a kid having a family/town in thrall. Then we jump into some action with Robin and Superboy racing away from a crowd of creepy doppelgangers of themselves. And then…we jump to the recent past to see how they got there. We follow Jon on an otherwise normal day, seeing him dealing with being a kid, going to school, and trying to stand up for someone who can’t otherwise stand up for themself, while he HAS the power to do something. We also see Damian dealt with parentally by Batman, forced to face academics rather than action. Of course, he winds up sneaking out anyway, and enlists Jon’s assistance, as Superboy and Robin are on the case. Little realizing what an appropriate adult figure they’d bump into…the boys are in trouble, one way or the other, and we’re but one issue in. I don’t know what I expected, exactly, from this series, outside of the hype and promise of its potential (see my opening paragraph). I’m at once drawn to, yet put off by, the art. It has a clear, energetic quality to it, a bit cartoony without being ridiculous. And I suppose it reminds me a bit of the look of the Young Justice series from the ’90s somehow, though that may just be a track of thought with no fruit…the mind can be a funny thing sometimes. 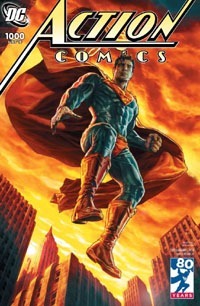 The art certainly fits the title, but I guess visually I was just expecting something more along the lines of Jim Lee, Ed Benes, or some other familiar/iconic Superman and/or Batman artist. So while not my first choice, the art IS good, fits the story, and one can follow the action and such just fine. I’m sure it will grow on me, and become iconic in its own way, if there’s not a rotating art team or such on this title. Story-wise, this fit in quite well with the "backdoor pilot" story we had a couple months ago in the Superman title, as well as fitting with what I’ve read of both Jon and Damian over the years in general. We seem to be getting a new "villain" for the story, some new threat that is NOT just the kids facing some cheesy or cast-off villain from their dads’ rogues gallery(ies). And though the dads are part of the story, the story is not about them–they’re rather typically incidental. But we’re also given plenty of first-issue material here (which is good since this IS a first issue!) 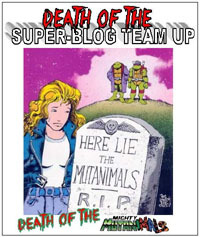 in being introduced to the title characters, their supporting cast/relevant family, see them in their own elements, together, and then they’re brought together TO "team up," and encounter a threat that may be beyond either of them individually…and then a direct encounter with someone neither one of them would WANT to encounter. 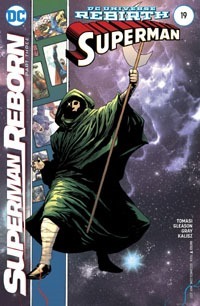 This is a rich issue for me, having read plenty of (older) Batman and Robin stuff, and plenty of stuff throughout Damian’s 12-ish year existence, as well as the past 8-9 months of Rebirth-era Superman stuff, and the earlier Lois and Clark mini that came out of the events of Convergence (itself nearly 2 years ago). But just knowing tangentially that these are the biological, actual SONS of Superman and Batman, you can jump in and pick up from this issue alone, with its own context and such. The primary drawback here is that this is but one issue, and compared to the biweekly main Superman/Action and Batman/Detective books I believe this is monthly…so it’s going to seem drawn out. And though elements I’d expect of a first issue are here, it’s "just" part one of the story, and I’d be quite shocked if this is any less than 6 chapters…this feels like a solid opening chapter of a serialized graphic novel. All in all, if you have enjoyed these characters in the past–individually or their "team-up" in Superman a couple months back–or are at all intrigued at the notion of the sons of Superman and Batman interacting/having their own adventures…this is a good start. I’ll certainly be giving it another issue or so myself before deciding if it fully seems more worthy of a graphic novel than being strung out as single issues. For now? It’s only $2.99, and well worth at least giving it this single issue to get your interest up, with what it shows AND what it "promises."